There are cases when you simply know that you can’t wait a week or two for the next available slot. You need care now! Either you’re in a great deal of pain, or your everyday life is impacted to an unacceptable degree because of an issue with your mouth, gums, or teeth. 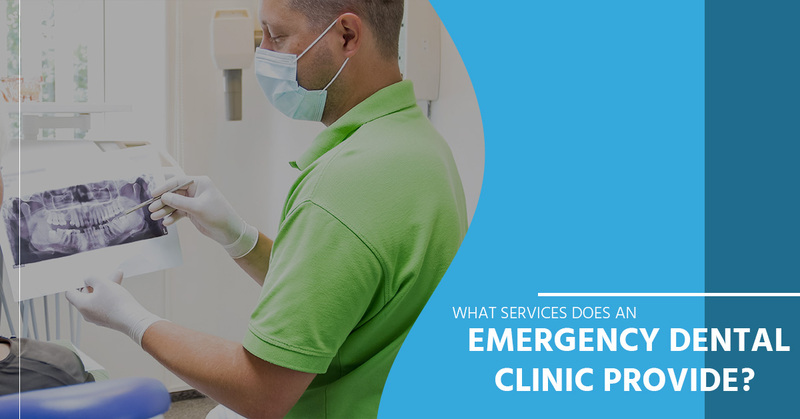 Any of these instances qualifies as an emergency, and you are correct in seeking care at an emergency dental clinic. Perhaps the top reason patients seek care at an emergency clinic is to alleviate pain. The type of pain can vary, from dull and throbbing to sharp and constant, for example. Regardless, pain is pain, and one of the primary services offered by an emergency dentist is stopping the intense discomfort you may be feeling. Once the pain is under control, it becomes easier to assess what the problem is and what the next step may be. Your emergency dental care provider may opt to perform treatment right away, may first need to do exploratory work, or may send you home with pain management medications and schedule you in for a more routine (or perhaps more comprehensive) procedure in a week or so. With pain under control, you can likely get back to your daily life and come back at a later date for additional treatment. If there is significant damage from an injury that simply can’t wait another day, make an appointment with an emergency dental clinic. Damage could be a tooth that’s been chipped or cracked and is hurting you quite a bit. It could be a split-open lip caused by careening into someone during sports. It could be any number of dental or mouth-related damage scenarios that need to be tended to right away. Your emergency dental care dentist will know what to do; all you have to do is find someone to give you a ride to the clinic! A tooth that’s been knocked out of its socket needs immediate attention. Whether it has fallen out completely or is still in place (barely), the tooth has a significantly higher chance of being saved if you seek emergency dental help right away. Don’t delay; go to the emergency dental clinic nearest you! Gums sometimes bleed a little, especially after vigorous brushing, or after you’ve bitten something especially crunchy or with sharp edges. However, bleeding from the gums or any part of your mouth that just won’t stop is cause for concern. Seek emergency dental care right away. Crowns are designed to be strong, durable, and permanent. Even though, occasionally a crown gets dislodged. For most people, it’s not possible to eat or continue with one’s weekly routine when there’s a loose crown inside their mouth. For this reason, a dislodged crown is viewed as an emergency that needs attention right away, whether or not there is any associated pain, or the pain is mild. If you or a family member is experiencing a dental emergency, don’t delay! Get in touch with White Smiles Family Dentistry right away. You do not need to suffer through the pain, especially if it’s throbbing or intense in any way, when the simple solution is to pick up the phone and call us, or have a trusted friend or family member make the call for you. Our dental care team is here to assist you with your dental emergency and get you the help you need.